CannAmm is proud to announce the first urine express test that aligns with Canadian Model 6.0 in Canada. This past year, the most recent version of the Canadian Model For Providing A Safe Workplace included the introduction of semi-synthetic opioids. 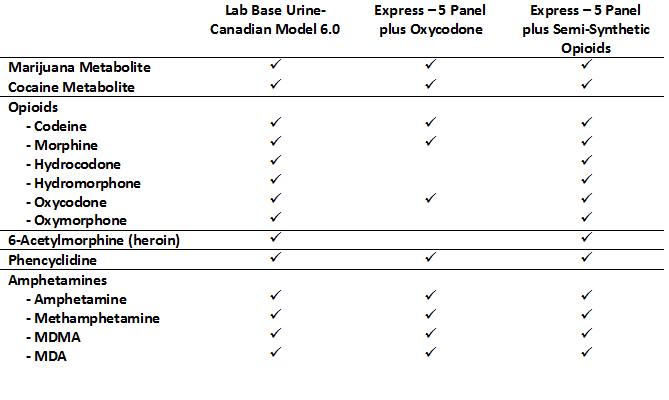 Until today the closest Express urine test kit in the Canadian market was 5-panel plus Oxycodone. CannAmm is now offering 5 Panel plus Semi-Synthetic Opioids in Express and Express to Lab options. You can see the drugs covered in the chart below. Adding these drugs to your account is completely at your request. CannAmm will not be forcing any clients to adopt these additions into their drug tests. For pricing information or to add Semi-Synthetic Opioids to your lab-based urine, express, or express-to-lab tests, please reach out to your CannAmm Account Manager, our Sales Team at 1.800.440.0023 Option 8 or by email: sales@cannamm.com.